Start the pulled pig the day before by rubbing it with generously with dry rub, covering, and refrigerating overnight. 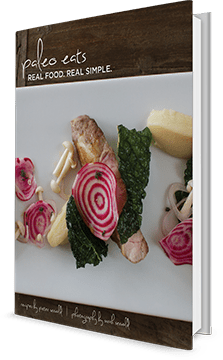 The next day, put the pork shoulder into a crock pot or slow-cooker and add the coconut water. Set the heat to low and allow the pork to cook all day (~8hrs). About an hour before the pork is ready, preheat your oven to 350 degrees. Place the plantains on a baking sheet (I like to cover mine with foil to make cleanup easier) and bake for 60 min. When the plantains are done, they should have the consistency of a firm baked potato. 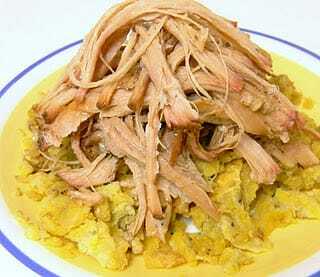 To serve, pile some mashed plantains on a dish and spoon some of the cooking liquid over them. Add a generous heap of pulled pork and dig in. Remove the peels and cut the plantains into 1-2" chunks. Using a potato masher or a large spoon, mash the plantains, adding a coconut oil or red palm oil if desired.